“Mother Tongue” is a collection of fine jewelry in Hebrew, Yiddish and Aramaic created by artist Yael Kanarek during her fellowship at LABA House of Study at the 14Y. Kanarek created the works inspired by texts from the Bible, Zohar, Lea Goldberg, Celia Dropkin and her grandmother. 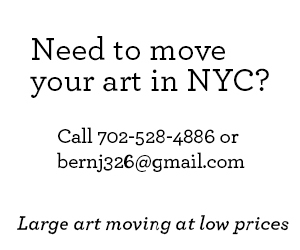 The works are created with a typeface Ms. Kanarek designed specifically for this purpose. The works are available for purchase at Aleph Foundry. 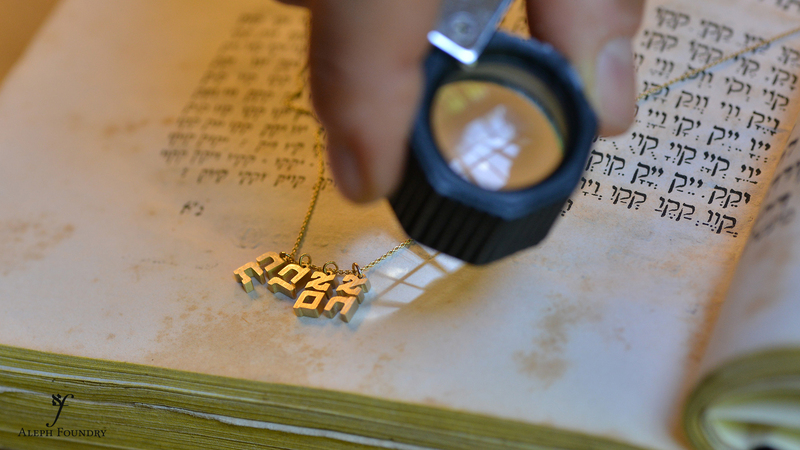 She also creates custom jewelry with Roman or Hebrew alphabet. 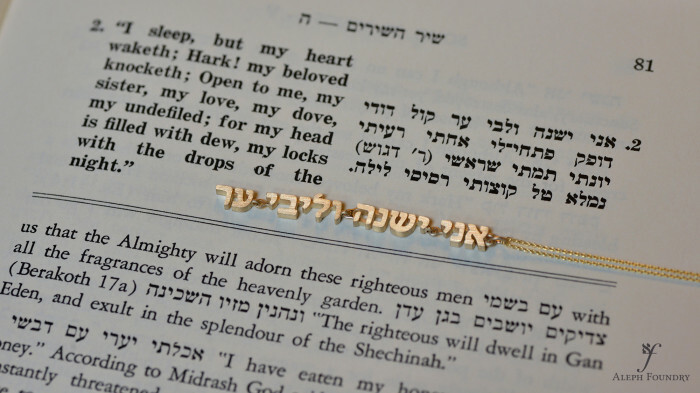 The “Family Charms” bracelet was inspired by a passage from Tikkunei HaZohar, an independent book that reinterprets the first word of Genesis, bereshit (“In the beginning”). One passage links each member of the nucleus family with one letter from the unpronounced 4-letter name of God יהוה. Av (father) with Yod, Em (mother) with Heh, Ben (son) with Vov and Bat (daughter) with Heh. 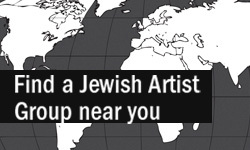 These four words are spread throughout the Hebrew alphabet in such a way to encompass the whole alphabet system. Thus, within the family, a world is born. Wear this bracelet on your right hand or if you’re a lefty, on your left. The hand of doing. May we do with divine inspiration. “Family charms” necklace features the ancient Hebrew words Av, Em, Ben and Bat — father, mother, son and daughter. 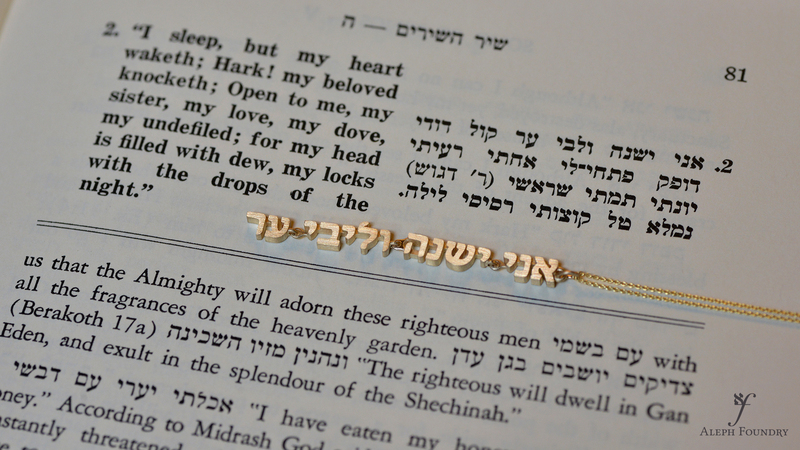 These charms are inspired by a passage from Tikunnei HaZohar, a Kabbalist text that elaborates on the Book of Genesis. 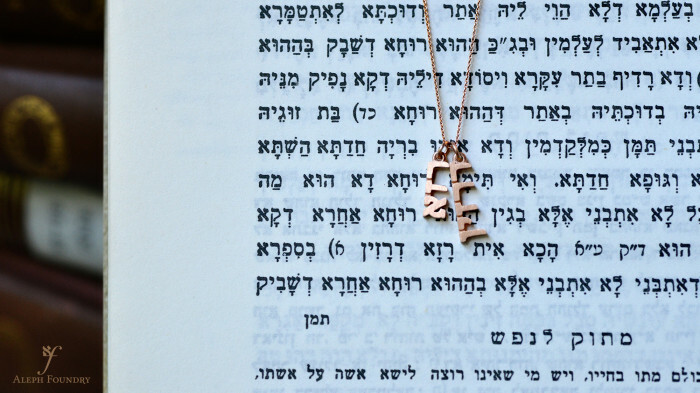 In the book, each family member is linked with one letter of the unpronounced name of god יהוה, reaffirming the spiritual connection of the family. The word for father begins with the aleph and the word for daughter ends with Tav, the last letter. Thus between father, mother son and daughter, all words are possible a the world comes to be. 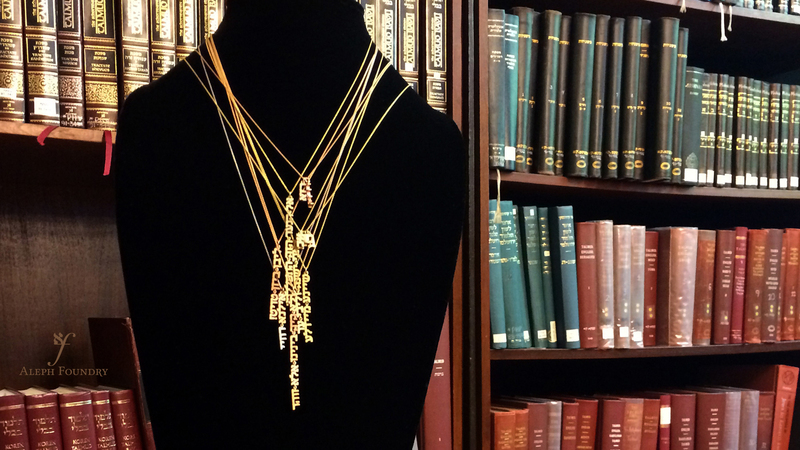 The charms can be recombined to represent the diversity of all families structures. Ilana deKhayey means Tree of Life in Aramaic. The Tree of Life symbol is a universal mythological icon of intelligent life. We see it represented in culture often, most recently in two acclaimed movies: Avatar by James Cameron and The Tree of Life by Terrance Malick. 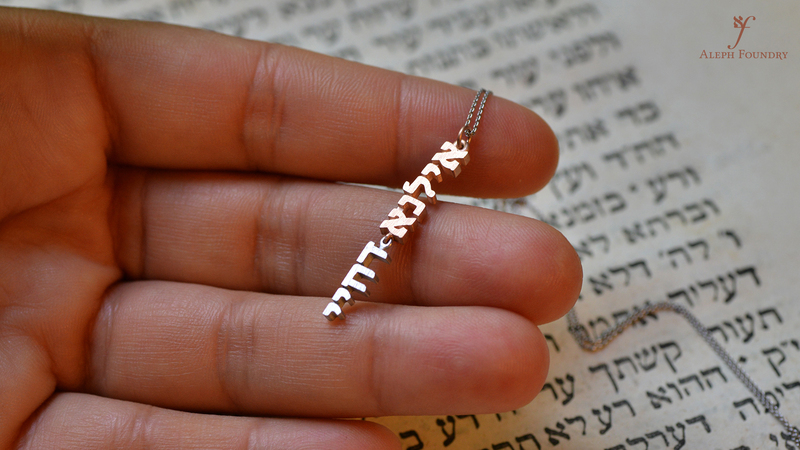 The word ‘ilana’ (tree) is in rose gold and the word ‘deKhayey’ is in white gold. This pendant is a reminder of our inner most connection of the divine care that The Tree of Life symbol expresses. It’s late at night. She’s in bed. Her body is asleep but her heart is listening for her lover to come up to her door. This insightful line comes from Song of Songs, the one book in the Old Testament written mostly in a woman’s voice. What unfolds is a poetic love story of attraction and rejection.